A riveting thriller that keeps you wondering right to the end – and beyond. 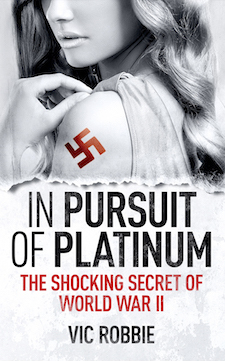 AS the Germans invade Paris in 1940 American Ben Peters attempts to smuggle a fortune in platinum out of the city in the legendary Bullion Bentley. But the Bentley is carrying an even more valuable human cargo, a mysterious Frenchwoman escaping with her young son and a secret that could change the course of the Second World War. Alena and Ben are the targets of Hitler’s ruthless investigator, whose family will be executed if he fails. His orders are to silence Alena before she can reveal her secret; capture her son and take him back to Berlin; and recover the Banque de France’s platinum. As they flee their hunter, they experience the stark and tragic realities of war and the raw emotions of two heroes living on the edge of fear. And not everything is as it seems. Who is Alena and what is her secret that could destroy everything Adolf Hitler and the Nazis stand for?